An 8–character alphanumeric LCD with user-friendly icons shows a variety of information and operating status such as caller's name, received message, etc. 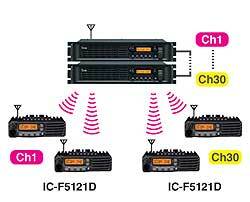 The IC-F52121D series can receive both analog mode and digital mode signals on a single channel and automatically selects the received mode to reply to the received call, while the talk back timer remains. 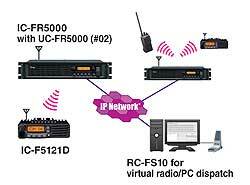 It's a smart way to grow into digital radio – at your own pace, as your budget and comfort allow. 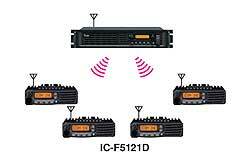 The IC-F5121D series allows you to call individual or group users. The radio automatically sends own ID number when the PTT button is held down. The alias name or individual/group ID is displayed on the LCD while receiving a message allowing you to identify who is calling. Up to 100 status conditions can be set and sent with voice call. Also, you can request another IDAS radio to send their status and receive it. 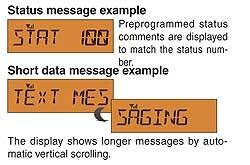 Up to 100-character of short data message can be sent and received. To send more than 9-character short data message, PC connection is required. 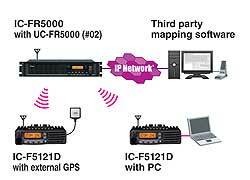 When used with an external GPS receiver, the IC-F5121D series can transmit accurate position data for use with vehicle management applications. 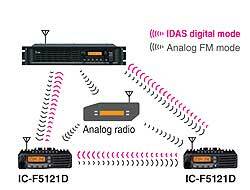 When using the IC-F5121D series in IDAS multi-site conventional mode, the IC-F5121D can communicate with other IDAS radio users working with other repeater sites and/or virtual radio/PC dispatch stations on the IDAS network. 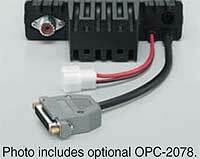 The IC-F5121D series can be used in an IDAS single-site trunking system. The IDAS trunking system is a distributed system with no dedicated control channel, so more voice traffic channels are available for increased system capacity.